Oleoresin capsicum is a high-quality raw materials, the use of advanced extraction process crafted a dark red oil-soluble oil-like liquid natural pigment. Oleoresin capsicum is a high-quality raw materials, the use of advanced extraction process crafted a dark red oil-soluble oil-like liquid natural pigment. Its main ingredient is chili red pigment, Pepper Yuhong Su, rich in B-carotene and vitamin C, belong to the carotenoid, the adjustment of physiological metabolic functions. Capsanthin with high security, heat, light, free from the environment PH value and impact of metal ions can be widely used in aquatic products, meat, pastries, salads, canned food, beverages and other food, beverages, cosmetics as a coloring agent in the pharmaceutical industry as intermediates. 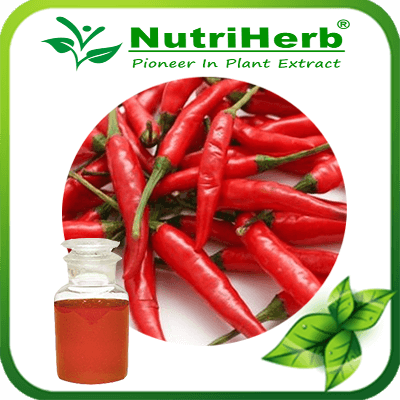 Oleoresin capsicum is a carotenoid, is currently popular anti-oxidants. Chili pepper for the Solanaceae genus, spicy berries of the year to end or perennial herb, alias also Pepper, hot pepper, Qin pepper, spicy eggplant, sweet pepper, Caijiao, pepper and so on. Moisture content per 100g of fresh pepper 70-93g, starch 4.2g, protein 1.2-2.0g, Vitamin C73-342mg; chili main vitamin A. The spicy pepper is capsaicin (C16H27no3), capsaicin mainly in the placenta and the skin around the diaphragm into the table cells.